I’m Trying Not to Brag. Do you see what I am talking about? Look at the bottom of the page. Here. Closer. Oh, and if you would like the pattern for yourself, you can get the .pdf right here. Just sayin’. September 18th, 2008 | Tags: Knitting, Pattern | Category: Misc. 37 comments to I’m Trying Not to Brag. Wow, that totally intrigues me!!! 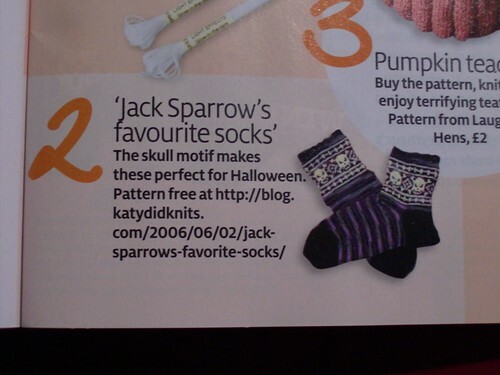 They spelled favorite with a u despite the fact that the pattern name is spelled without it…would an American magazine spell the title (which is also the pattern name) the American way even if the pattern name was spelled the British way??? But aside from splitting hairs–very cool!!!! Yay for you! I guess I know a real live knitting star. I am humbled by your greatness. Brag away! That is so awesome! Definately worth braggin’ about! Yer famous in the UK now! Oh My God! I just got my copy and didn’t even see that! (I was flipping too quick apparently). Awesome! Congratulations!! That is extremely cool. And to respond to Bezzie’s question, Yes, I’m guessing a U.S. pub WOULD edit out the u’s. The Yarn Harlot blogged about it — her publisher edits out all of her “briticisms” in all of her books. And yes, I’ve now added “Stop at borders and see if I can find this mag” to my list of errands for today! Dude! Brag it up! 🙂 That is awsometown! Very cool! 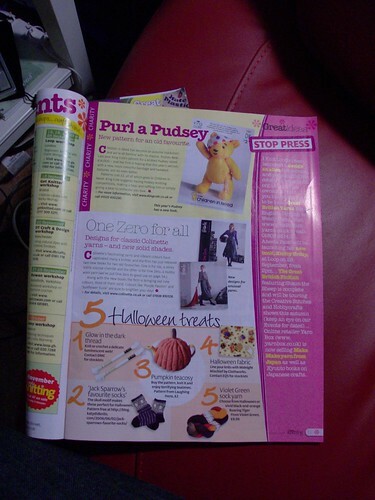 And now I have yet another knitting magazine to look for… Will you autograph it if we ever meet? I promise not to stalk! That is so awesome, Congratulations!! Brag it up!! That’s really, really cool! That is so awesome! Congrats and I think you need to brag some more. Well, it’s about time that you were publicly acknowledged for your general overflowing of awesome. Congrats! Totally cool! I love those socks. We have a knitting celebrity in our midst! Fantastic for you, but why are you giving this most awesome pattern away for free?? I love that magazine!! I love it even more now that you’re in it! Drat that my subscription run out but now I have a wonderful excuse to re-new!! Eeeeeeee! Now that you’re internationally famous, you won’t forget us little mateys, now, will you? Awesome!!! You go with your bad self! Whoo–so does this mean I have to pay you to be my friend? Seriously, congrats! Fabulous!! Now all of Europe will know how cool you are! congratulations! It’s probably ok to let it go to your head a little, I mean they are awesome! Why be modest? Especially with us, your adoring fans! We all know how awesome you are – DUH! !